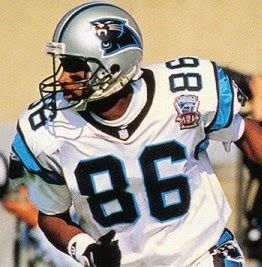 The Carolina Panthers, one of two NFL expansion teams for the 1995 season along with the Jacksonville Jaguars, took the field for their first regular season game on September 3. Coached by Dom Capers, most recently the defensive coordinator of the Steelers, the Panthers were coming into their first season facing the usual obstacles of a new team, utilizing either unproven or over-the-hill talent, but GM Bill Polian had been aggressive in free agency. The Panthers were to feature a conservative offense, tough defense, and solid special teams. QB Frank Reich (pictured above), the long-time backup in Buffalo, was starting while first draft choice Kerry Collins was groomed to take over the job, and there were veteran receivers in WRs Mark Carrier and Willie Green plus TE Pete Metzelaars. LB Sam Mills, formerly of the USFL and Saints, provided leadership as well as ability at inside linebacker, and there were other established hands in LB Lamar Lathon and CB Tim McKyer. The Atlanta Falcons, Carolina’s first opponent, were coming off a 7-9 record in 1994, their third straight losing season and first under Head Coach June Jones. Operating a run-and-shoot offense, QB Jeff George threw for 3734 yards and 23 touchdowns and, while free agent WR Andre Rison departed in the offseason, there was a good group of small but fast of receivers for George’s passes. The defense was of greater concern, having given up a lot of points and fallen short in close contests in ‘94. There were 58,808 fans in attendance at the Georgia Dome. The Falcons had the game’s first possession and went three-and-out. Carolina then went 65 yards in eight plays. Frank Reich had completions of 20 yards to Willie Green and 10 to Mark Carrier. Another pass to Carrier picked up 18 yards in a third-and-13 situation to reach the Atlanta 19. Following two carries by RB Randy Baldwin, Reich threw to Pete Metzelaars for eight yards and a touchdown. John Kasay added the extra point. It didn’t take long for the Panthers to add to their lead. WR Roell Preston fumbled the ensuing kickoff and RB Vince Workman recovered for the visitors at the Atlanta 22. This time Carolina was only able to pick up a yard in three plays, but Kasay kicked a 39-yard field goal to make the score 10-0. 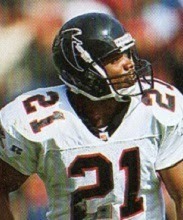 The Falcons came back with a seven-play, 47-yard series that was highlighted by Jeff George connecting with RB/WR Eric Metcalf (pictured at left) on a third down play for a 36-yard gain to the Carolina 16. Morten Andersen, a newcomer to the club after thirteen years in New Orleans, booted a 27-yard field goal to make it a seven-point margin. Reich came out throwing on the next Carolina series, hitting Green for 11 yards and then Carrier for 46 yards to the Atlanta 23. The Panthers were unable to move any further but came away with another Kasay field goal, this time from 41 yards. The teams traded punts as the game moved into the second quarter. Taking possession at their own two yard line following a Carolina punt, the Falcons came through with a big play when George threw to WR Bert Emanuel for 46 yards. George completed six more passes as Atlanta moved 98 yards in 11 plays, the last for a 12-yard TD to WR J.J. Birden. Andersen’s extra point narrowed Carolina’s lead to 13-10. Following a short series by the Panthers, the Falcons drove to another score. George completed three passes but, after reaching the Carolina 33 at the two-minute warning, two more throws fell incomplete and Andersen kicked a 51-yard field goal. The score remained 13-13 at the half. The Panthers were forced to punt following the first series of the third quarter and the home team went 58 yards in seven plays to take the lead. George threw to WR Terance Mathis for 23 yards and, in a third-and-eight situation, connected with Mathis again for 19 yards to the Carolina 14. Three plays later, he tossed a five-yard touchdown pass to Emanuel and, with Andersen’s PAT, the Falcons were in front by 20-13. The defenses took control as neither team was able to sustain a drive until, with less than four minutes remaining in the period, Metcalf took off for a 19-yard gain to spur a series in which the Falcons reached midfield. However, FS Brett Maxie intercepted a pass to end the threat and the score remained tied heading into the final period. The teams continued to exchange punts until RB Craig Heyward of the Falcons fumbled and Maxie recovered for Carolina at the Atlanta 22. However, two penalties and two sacks moved the Panthers back to the 44 and they were forced to punt. Carolina got the ball again on a punt with 1:15 remaining in regulation. Starting at his own 20, Reich passed to RB Bob Christian for 23 yards and, after two incompletions, to Green for 13 yards. Reich threw long to Green once again, and the result was a 44-yard touchdown. A gamble for a two-point conversion was nullified by a false start and, backed up five yards, the Panthers kicked to tie the score at 20-20 instead. Getting the ball back with 20 seconds on the clock, the Falcons tried to win the game in regulation as George completed two passes, but a 58-yard field goal try by Andersen fell short and the contest went into overtime. The Panthers had the initial possession in the OT period and Reich completed two passes, but fumbled when stripped by DE Lester Archambeau, who recovered the ball at the Carolina 31. Six plays later, at 2:42 into the extra period, Andersen booted a 35-yard field goal and Atlanta came away the winner by a final score of 23-20. The Falcons led in total yards (391 to 312) and first downs (20 to 17). Carolina was hurt by gaining only 51 yards on 20 running plays and giving up nine sacks. The Panthers also committed seven penalties, to four flags thrown on Atlanta. By contrast, the Falcons gave up three sacks and were more balanced on offense, rushing for 117 yards while gaining 274 net passing yards. Jeff George completed 27 of 45 passes for 290 yards and two touchdowns while giving up one interception. Eric Metcalf had 9 catches for 95 yards and ran for 56 yards on just 7 carries. Terance Mathis contributed 8 receptions for 83 yards and Bert Emanuel added 6 for 90 yards and a TD. Craig Heyward paced the ground game with 61 yards on 19 carries. For the Panthers, Frank Reich was successful on 23 of 44 throws for 329 yards and two TDs while giving up no interceptions. Willie Green (pictured below) pulled in 7 of those passes for 121 yards and a score and Mark Carrier had 5 receptions for 96 yards. Randy Baldwin led what there was of a running attack with 43 yards on 17 attempts. The Panthers went on to lose their first five games before reeling off four consecutive wins on the way to a respectable 7-9 record, placing fourth in the NFC West. They also defeated the Falcons in the rematch at Clemson Memorial Stadium. Atlanta lost the next week but then won three in a row and finished at 9-7, placing second in the division and qualifying for a Wild Card spot. The Falcons were defeated by Green Bay in the first postseason round. 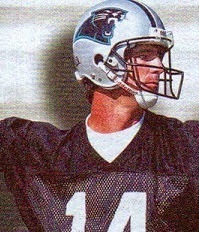 By the point the season turned around for the Panthers, Frank Reich had given way to Kerry Collins as the starting quarterback. He ended up throwing just 39 more passes, completing 44 percent in all, and the two TD passes against the Falcons were his only scoring tosses. Mark Carrier and Willie Green remained effective receivers, with Carrier catching 66 passes for 1002 yards (15.2 avg.) and three touchdowns and Green hauling in 47 for 882 yards (18.8 avg.) and six TDs. Eric Metcalf continued to be highly productive for the Falcons with 104 pass receptions for 1189 yards (11.4 avg.) and eight touchdowns to go along with his 133 yards on 28 rushing attempts (4.8 avg.). Adding in kick returns, Metcalf gained a total of 1983 all-purpose yards, which ranked fifth in the NFL. Terance Mathis and Bert Emanuel also had over a thousand receiving yards with 1039 apiece, on 78 and 74 catches, respectively.